The 2015 – 2016 series kicked off on Sunday, November 15 with a 4.6 mile run at Mariposa Park and a potluck afterwards hosted by our wonder president, Gwen Walker. This is the second year in a row that Gwen has hosted the November handicap and is the second year in a row that bad weather has occurred on the same day. 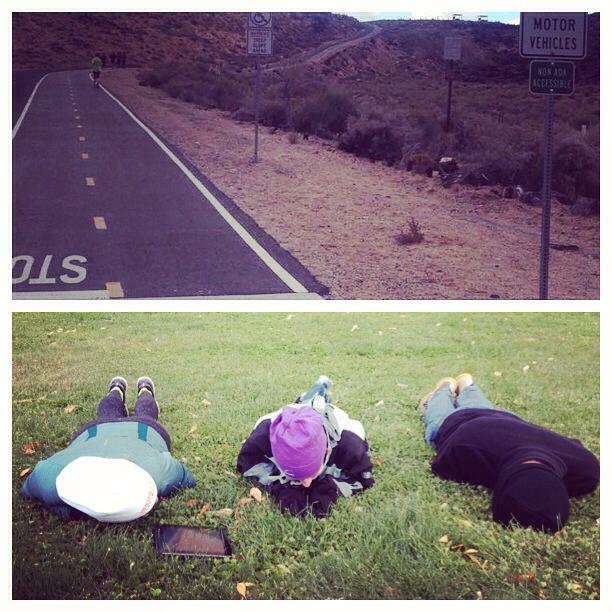 For any of you that ran in our November 2014 handicap, you’ll remember the driving winds and freezing temperatures that forced some volunteers to seek shelter on a protected hillside. Luckily this year we dodged the weather bullet with only a tiny amount of rain starting to fall just as the runners finished. It seems the fear of bad weather may have kept some people home but those that did show up enjoyed very pleasant running weather and a probably not-so-pleasant hill in the middle of the course. 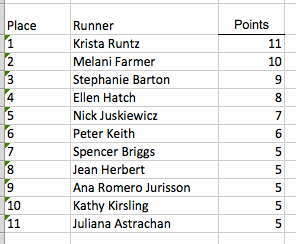 Krista Runtz was our handicap winner this month. Peter Keith, who came out to test his short distance speed was our fastest runner, turning in an impressive 6:14 pace! We also had several amazing volunteers on the course – Rachel Kinney, Lorna Kindel, David Kaufman, and Gwen Walker. They did a great job making sure the runners made correct turns (and nobody got lost!). Enjoy this 4.6 mile out-and-back course in a beautiful Westside park. Much of the route is stroller friendly, but strollers will need to turn around at the 2 mile mark (so you won't be able to complete the entire race). Please bring a dish to share for the post-race breakfast gathering. Dogs are permitted in the park and in the race, BUT our hosts' home is not dog friendly (they have their own pooches), so if you plan to attend the post-race potluck, please leave your pups at home! From the north, take Coors to La Orilla, and head west on La Orilla. Turn left (south) onto Taylor Ranch Road. Turn right (west) on Kachina. Take the first right into the park. From the south, take Coors to Montano Rd and head west. Turn right (north) on Taylor Ranch Road, then left on Kachina. Take the first right into the park. Directions to the Walkers' home will be provided at the race.